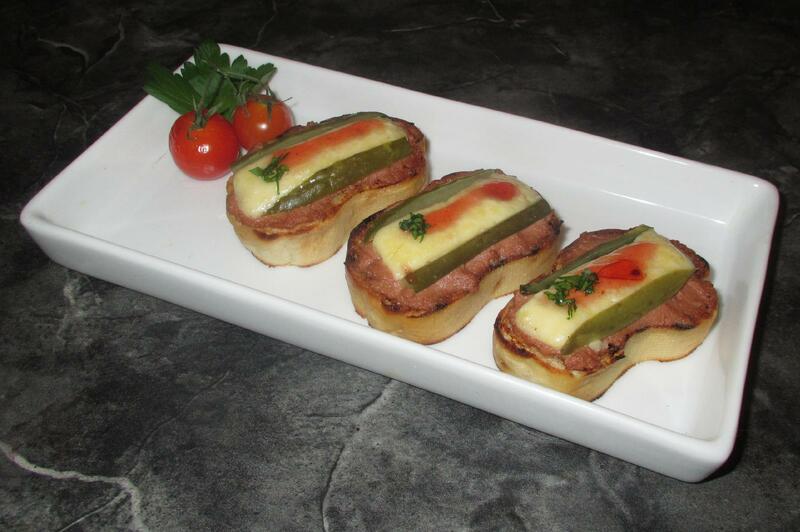 There is no actual recipe today (none really needed, actually)… Rather, I just thought I’d show you a little canapé I put together as a snack for my wife and me. I have called them ‘Wensleydale Bites’ because I used lovely Wensleydale Cheese which comes from Yorkshire in England and is a bit like a sharp white Cheddar. Basically, I toasted some slices cut from a small baguette, brushed each with some of my homemade Garlic Oil, and then spread them with liver pate. On top of this, I put strips of the cheese straddled by slivers of pickled gherkin and then I grilled everything just until the cheese started to bubble. Finally, I drizzled over a little Cranberry-Chipotle Jelly and garnished with chopped parsley. I have to say these were very good and I am looking forward to playing with the basic theme as my wife and I love this kind of ‘snackie’. I only used a cheap, canned pate on this occasion but maybe something a little more expensive and decadent will get used next time. I may even try making a flavored jelly of my own as well….